There's a Yale hoist for every lifting job. Yale variety lets you match your hoist to the job for maximum dollar value. Hoists in the Yale line are quality engineered and performance tested before they are shipped to you. That's why the Yale name has stood for quality for over 100 years. 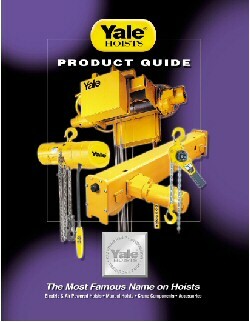 Look up to Yale hoists for excellence in hoisting equipment and crane components.